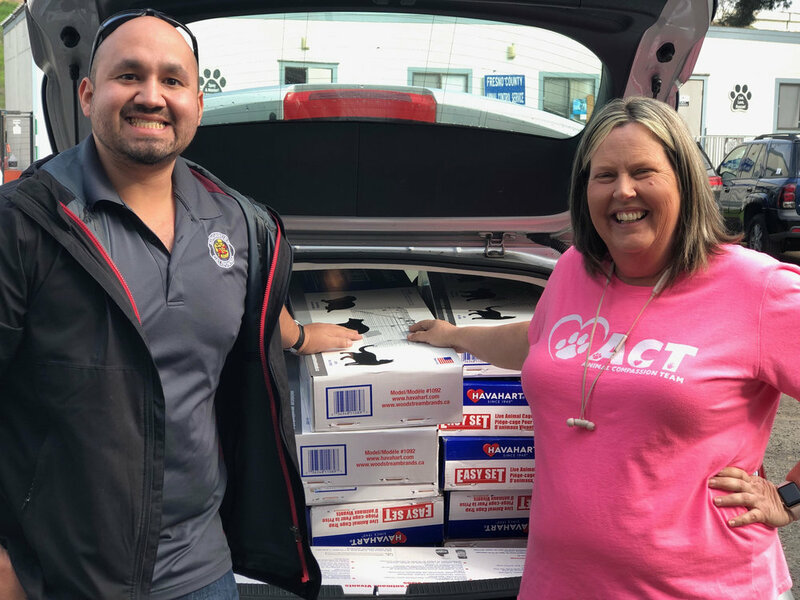 Pictured is Adam Castaneda, Community Services Director for the City of Kingsburg and Brenda Mitchell, President & Chief Life-saving Officer for Fresno Humane Animal Services posing with a full trunk of new cat traps bought with monies from a $5,000 grant gifted by an anonymous donor. The City of Kingsburg leads local, small-town communities by implementing progressive animal control services to help prevent the homeless animal population from exploding. Spring is a time for flowers, sunshine and a cosmic calling of the animals to procreate. Adam Castaneda, Community Services Director for the City of Kingsburg feels a sense of urgency to pick up the shipment of 15 new cat traps bought by a $5,000 grant from an anonymous donor. He plans to trap, neuter and return (TNR) community cats to their neighborhood to prevent the population growth of feral cats. Castaneda said, “The TNR program was initiated in October 2018 and we have caught 25 cats from 4 locations using borrowed cat traps already”. It’s one thing to have ordinances that promote the residents of a community to safely TNR cats but it’s a big deal when the city does it for themselves. That’s commitment, that is taking action. As a fellow “Kingsburg-ian” and an animal advocate, I am so proud that my hometown gets it. They understand the importance of TNR to maintain a healthy population of fixed cats is the ONLY humane method of population control. You see, you cannot kill your way out of a cat population crisis. Not only is it not humane, but cats are free-roaming agents that migrate, and they procreate fast. So, one year you may have managed to rid your cat population problem just to start over again the next year. A healthy colony of fixed community cats live their lives in peace; not having to fight for food or territory. Castaneda said, Sarah Chambliss, Community Services Commissioner and Kingsburg’s City Manager, Alex Henderson, spearheaded this TNR initiative and contacted Brenda Mitchell, President of Fresno Humane, for advice on how to get started. They didn’t just seek advice from Fresno Humane, they also borrowed cat traps from Animal Compassion Team of California to get started right away. Mitchell explained that swift action needs to take place now, in Winter, because once Spring and Summer hits the cat population blooms. Fresno Humane assists the City of Kingsburg by transporting the trapped cats from FHAS to the H.O.P.E. Animal Foundation and back, alleviating the City employees to navigate the paperwork process. Fresno Humane is also the administrator of the City of Kingsburg’s grant funding keeping track of monies used. Mitchell said, “We are here to make it easier for people who care to save lives”. Fresno Humane and Animal Compassion Team believes strongly in collaboration and wants to work with local towns educating about TNR to save even more lives. “We would love to see them learn the basic concepts of TNR and take the little bit of assistance we provide and grow the program,” said Mitchell. We need to support our local municipalities that promote humane animal control services for homeless pets with our voice and our wallets. Donations made to these programs create healthy, safe places for animals and humans to coexist in a neighborhood. If you would like to donate to the Kingsburg TNR project, make checks out to City of Kingsburg and note TNR program on the check. Castaneda also said, Kingsburg could use donations of wet cat food brought to Kingsburg’s City Hall. Please leave cats in traps alone. They are trapped for spay & neuter services only, no harm will come to the cat. Cats that are ear-tipped can be released immediately as that is a sign of a cat that has already been fixed. This kitty is an example of a cat that has been ear-tipped which signifies he or she has been fixed and can be released immediately.